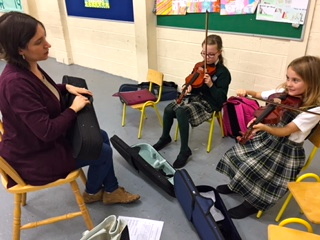 Ta áthas orainn sa scoil go bhfuil Jessie ó Chlub Ceoil an Bhlárnan ag teacht ar chuairt chugainn gach Luan ag múineadh ceoil dona daltaí i ndiadh am scoile. 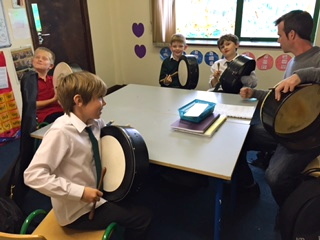 Múineann sí agus beirt múinteoir eile an fidil, an fheadóg stain, an bodhrán agus an guitár d'aon pháiste a bhfuil suim acu é a fhoghlaim ar chostas réasúnta. Bímid ag tnúth go mór leis an gceol a chloisint ar fud na scoile gach Luan! 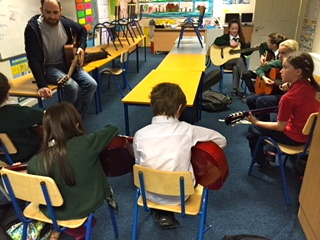 Gaelscoil Mhuscraí is delighted to host Múinteoir Jessie, Conor and John as part of our after-school Club Ceoil every Monday. 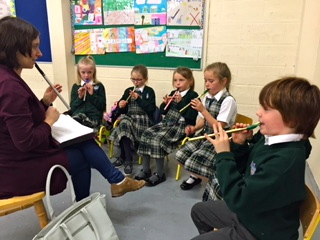 Students from 2nd to 6th can avail of very reasonably priced classes in a variety of Irish traditional instruments in small groups. 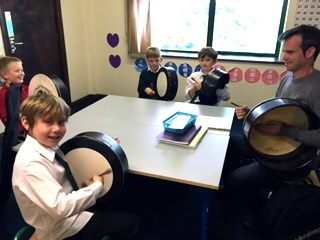 We look forward to the lively sound of music throughout the school every Monday.